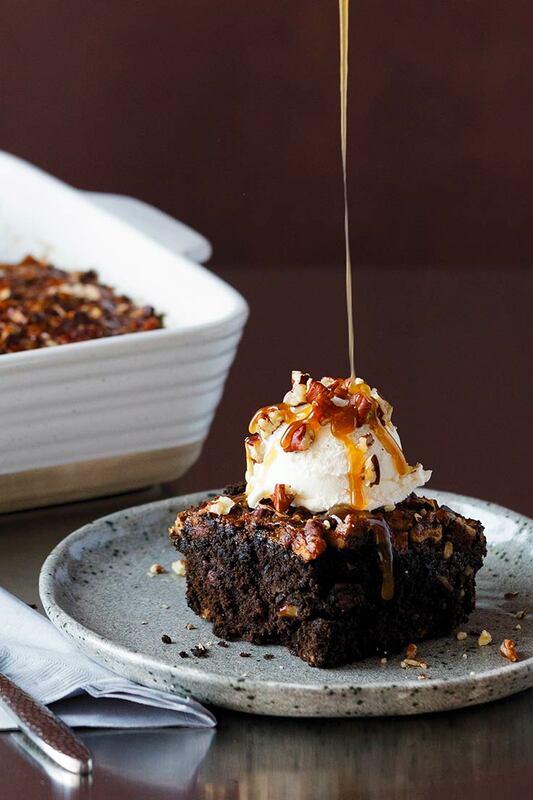 This recipe combines two deliciously rich desserts, brownies and pecan pie. They're absolutely irresistible served warm and à la mode! Makes one 8-9" pan of brownies. Preheat the oven to 375℉. Grease and line an 8" or 9" square pan (or grease a silicon pan) and set aside. In a large bowl stir together flour, cocoa powder, sugar, salt, and baking powder. Whisk together Espresso Coffee Extract, Bourbon Whiskey Compound, Madagascar Bourbon Vanilla, eggs, melted butter, and vegetable oil. Add wets to dries and stir to combine. Spoon the batter into the prepared pan, smoothing evenly. Bake for 20 minutes. Meanwhile, prepare the Pecan Pie Topping. In a sauce pan over medium heat, combine butter, sugar, corn syrup, salt, and Blue Agave Nectar. Stir until butter melts and sugar dissolves. Add Bourbon Whiskey Compound, Orange Zest Oil Extract, and Madagascar Bourbon Vanilla. 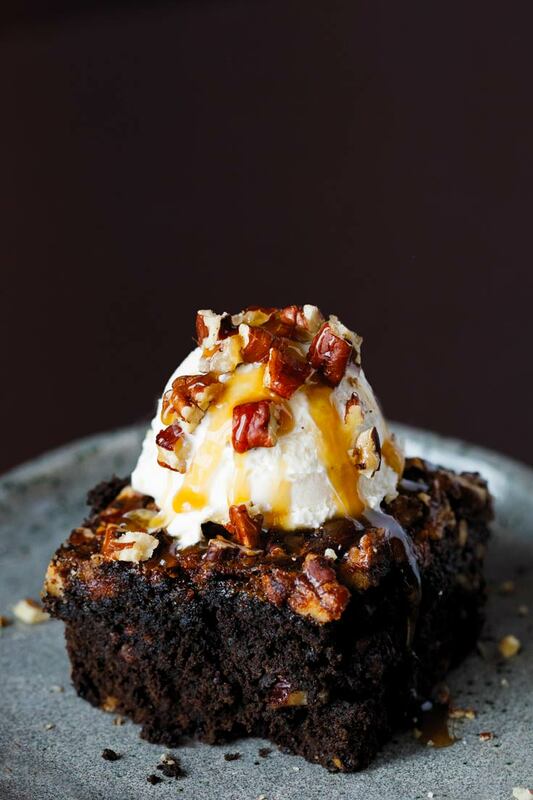 Remove Brownies from the oven, gently place the pecan halves on top of the batter. Pour the topping over the pecans and return to the oven to bake for another 30-40 minutes or until a toothpick inserted in the center comes out clean. The top of the brownies will feel almost firm and they will set up more while cooling. Rest for 20-30 minutes before removing the brownies from the pan. Gently pull the parchment away from the sides and let them cool completely before cutting, or wrap and chill overnight for easier cutting. For best results, use a silicone cake pan for easy release of the brownies. If you don’t have one, use a floured spray in an 8” or 9” square pan, line it with parchment paper (leaving an overhang for easier removal) then spray the parchment paper. 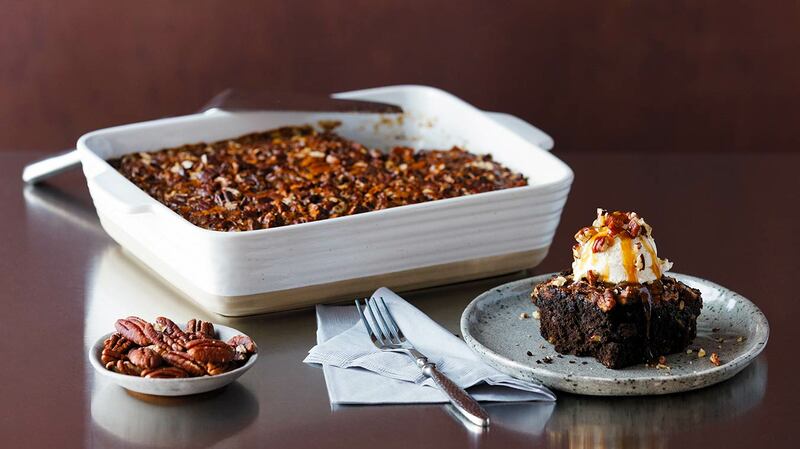 Pecan Pie Topping can be made up to 10 days ahead and refrigerated. Warm slightly and stir to emulsify all the ingredients before using. Once cooled, brownies can be individually wrapped and kept chilled for a week.